A dazzling view of the Oct. 14, 2009 (Eastern Time) launch of the Progress 35 cargo ship to the International Space Station was provided live via the Russian Federal Space Agency. Keeping the resupply linegoing to the International Space Station, the Russians have successfullylaunched their 35th routine but highly vital cargo-carrying spacecraft for theoutpost in a magnificently beautiful ascent. The unmanned Progressfreighter was blasted into orbit atop a Soyuz booster at 9:14:37 p.m. EDTWednesday from the Baikonur Cosmodrome in Kazakhstan. 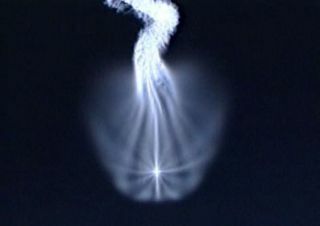 The launch came at localdaybreak, allowing the core-stage engines to produce an indescribable dawnspectacle and its third stage to be visible all the way to the horizon. A preliminary orbit wasachieved after the nine-minute climb to space provided by the liquid-fueledrocket. Onboard commands then extended the Progress craft's twopower-generating solar arrays that span 35 feet and unfurled communications andnavigation antennas. A pair of precise enginefirings scheduled for Thursday morning and another one on Friday night willguide the Progress toward its automated rendezvous. The docking is planned tooccur Saturday at 9:41 p.m. EDT. The 24-foot long ship willattach itself to the Pirs docking module's port that was vacated when the SoyuzTMA-14 capsule departed and returnedto Earth last Saturday with Russian cosmonaut Gennady Padalka, NASAastronaut Michael Barratt and Cirque du Soleil founder Guy Laliberte, who paid$35 million for an 11-day trip to the station. Wednesday's launch is knownin the station'sassembly matrix as Progress mission 35P. The spacecraft's formal Russiandesignation is Progress M-03M. The Russian-made craft willdeliver two-and-a-half tons of supplies to the station. The "dry"cargo tucked aboard the Progress amounts to 1,750 pounds in the form of spareparts, life support gear and equipment hardware. The refueling modulecarries 1,918 pounds of propellant for transfer into the Russian segment of thecomplex to feed the station's maneuvering thrusters. The vessel also has 926pounds of water. The space station isoccupied by theExpedition 21 crew of commander Frank De Winne, Roman Romanenko and MaximSuraev, Canadian astronaut Robert Thirsk and NASA astronauts Jeff Williams anNicole Stott.